This book highlights the immense contributions that immigrants make to the greatness of the United States, especially during this period of extreme negative views of immigrants and anti-immigrant government policies. 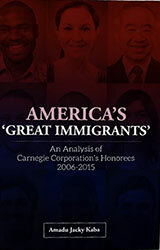 It examined the Carnegie Corporation of New York’s “Great Immigrants: the Pride of America” honorees from 2006 to 2015 and found that the 408 honorees during this period came from 87 countries and diverse professions. It also found that among the honorees are 24 Nobel Prize winners. Several of the honorees studied at Columbia University, Harvard University, Massachusetts Institute of Technology, New York University, Princeton University, Stanford University, the University of California, Berkeley, the University of Cambridge, the University of Chicago, the University of Pennsylvania, the University of Southern California, and Yale University. Available data show that 122 (30 per cent) of these honorees had a total net worth of $113.4 billion. The data also show that America will not be as productive and successful as it is today without the enormous contributions of immigrants. The data equally show that immigrants are among the most important employers and taxpayers in the United States. Amadu Jacky Kaba is an Associate Professor of Sociology at Seton Hall University. Prior to returning to Seton Hall University in 2005, he worked with the late renowned political scientist, Professor Ali A. Mazrui (Post-Doctoral Fellowship), teaching and conducting research in the Social Sciences both at Binghamton University, State University of New York, and Cornell University in Ithaca, New York, from July 2002 to June 30, 2005. He is the author of over 70 scholarly publications; including over 50 full-length peer reviewed scholarly journal articles and five books. He earned all of his degrees from Seton Hall University: B.A. in Political Science in 1997; Master’s degree in Public Administration (MPA) in 1998; and Ph.D. in Higher Education Leadership, Management and Policy in May 2002.